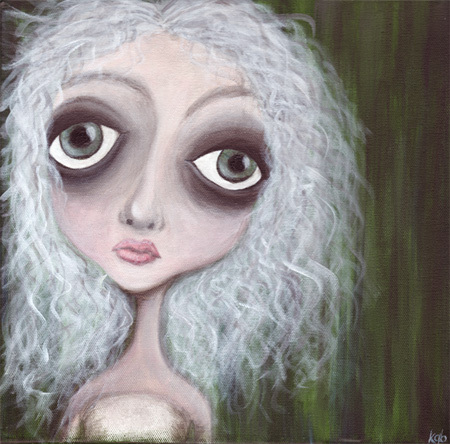 The first girl I painted was based on this particular doll – Danielle. I went back and forth when I started painting her, wanting to capture her image exactly as is (because I think she’s fantastically creepy and perfect and haunting), then realizing that her creator, Colleen Downs, might not appreciate that so much. I weakly attempted to make her more like one of my own girls instead of an exact copy, but because it’s soooo clear where the inspiration came from, I can’t help thinking my Danielle is just a watered-down version of the awesomeness that is the Loopy Boopy original. I’m forwarding this post to Colleen (did I mention she’s incredibly talented? *grin*), so hopefully she’ll weigh in. She creates such whimsical creatures I may have to ban myself from her sites so I don’t try to paint every single one of them! Your Danielle is totally awsome. I love “creepy girls”. It’s funny because I see your note exactly when I’m thinking of how put on paper/canvas what “creepy girl” I have in mind. Pingback: A Cagey Bee » Blog Archive » STOLEN!